B • Project background, members, activities and dedication – Yugoslavia - What Should Have Been Done? The project on conflict-mitigation in all parts of Yugoslavia – with the title Yugoslavia – What Should Have Been Done – began on August 30, 1991 with TFF’s conflict-mitigation team members arriving to Croatia’s capital, Zagreb. On September 3 – 23 years ago as this blog goes public – it visited the war zone in Osijek. It then drove to Slovenia’s capital, Ljubljana and via Hungary down to Serbia’s capital, Belgrade and ended its mission on September 14. 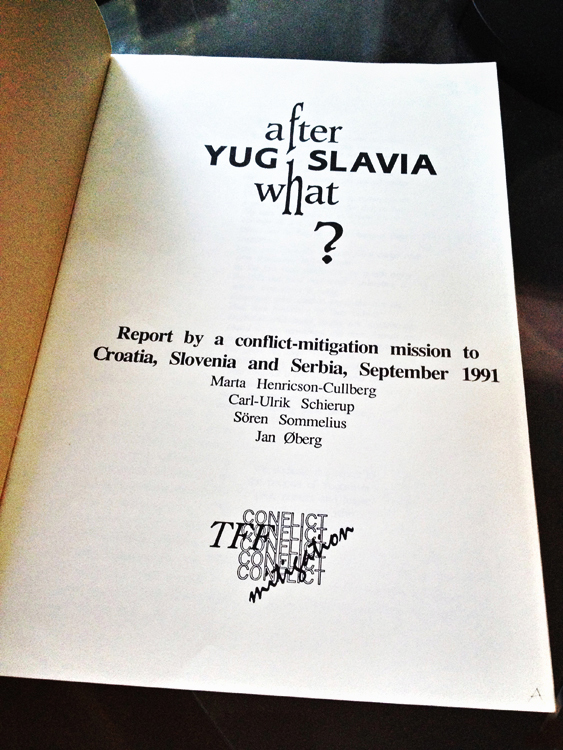 It resulted in the first of the 127 publications posted on this blog as we launch it today – “After Yugoslavia – What?” – and was published in Ocotber 1991 and presented shortly after to those we had met in September. And it contained no less than 75 proposals as to how to avoid war and create a safer region for all. That marks the beginning of the TFF project on now former Yugoslavia. It is ongoing at a less intensive level. But for the tree main authors in this blog it was way more than a research project. It was part of our lives. It’s most intensive period ended in 2005 and it is no longer the flagship project of TFF, albeit we still monitor from a distance what happens in the region. TFF needed to change the image of being only engaged in Yugoslavia and had begun working on the ground in Burundi in 1999 and in and with Iraq from 2002. Between 1986 and 1990, the foundation had engaged in traditional peace research – projects, seminars, co-writing, and publishing reports and books. In short, mostly at tables, desk and in chairs. Then we asked ourselves: Is this what we are going to do for the rest of our lives – or could we do what the specialists in medicine sometimes do: Move out of the research laboratory and meet some patients? In other words, what good is it if we are only theoreticians and our ideas, concepts and theories are never tested on the ground, in the real world? AS mentioned, TFF’s conflict-mitigation team went on its first fact-finding mission in September 1991 – a few months after the first shot had been fired in the war that eventually lead to the dissolution of Yugoslavia. Undoubtedly, this type of on-the-ground conflict analytical work was a pioneering effort at the time. For instance, TFF was one of less than a handful of organisations that worked in Kosovo and did early warning about what was to come years later. There were also very few non-Yugoslav civil society organisations in Krajina and Eastern and Western Slavonia when we had our our teams there. 1 • Conflict diagnosis and prognosis – thousands of interviews on all sides and levels. 2 • Production of peace proposals based on analyses – in conflicts where others had not done so, or as alternatives to peace plans worked out by international factors such as, say, in the case of the Dayton Accords for Bosnia-Hercegovina – all based on the UN Charter norm of making peace by peaceful means. 3 • Mediation – particularly in Croatia’s Krajina areas, Eastern and Western Slavonia as well as Kosovo. 4 • Peace education and training seminars with, say, local mixed youth groups, journalists and editors and peace organisation. Also lectures at academic institutions in various republics. 5 • Various tasks commissioned by international missions there, such as UNTAES in Vukovar asking TFF to conduct reconciliation work among local teachers and reconciliation among local Croat and Serb leaders as well as primary and secondary school pupils. 6 • Local media work: Press conferences and interviews/articles to local media. 7 • Advisory work – such as serving as goodwill (unpaid) advisers to leaders on both/more sides, predominently in Belgrade and Pristina. Or writing early warning analyses for international organisations. 8 • Writings: Mission reports, book chapters etc (most of it in this blog) for the academic community as well as lay readers. Disseminations of such writing to media and international organisations such as the UN in New York (Yugoslav desk and Department of PKO). 9 • Public education in the international community outside the conflict region – media, speeches, newspaper articles, international media such as CNN, radio and television commentaries and panel discussions, public lectures and civil society debates in both Europe and the US. • TFF Friends – not the least, these faithful “ordinary” citizens around the world without whose economic and moral support it would have been impossible to both conduct the entire project and also remain totally independent of governments and business during these years (See below). The project has been made possible/easier and low-cost because no one ever received a salary or other remuneration for the work in and with Yugoslavia. TFF remains an all-volunteer research think tank. Finally, it should be mentioned that the Swedish Ministry of Foreign Affairs gave TFF a general organizational grant from 1990 but discontinued it in December 1999 (and ever since) – 6 months after NATO’s bombings – because of TFF Associates’ consistent and outspoken international media presence against NATO’s bombings and in favour of a negotiated solution of the conflict in and around Kosovo. TFF is the only civil society organisation thrown out of the government’s budget. Here is the background to this authoritarian decision which, by the way, the Ministry kept no minutes of. The foundation believes in the ideal of free research and has been people-financed and independent of governments and corporative money ever since. Should you wish to support TFF click here. We dedicate this blog to the same people plus those who live today in what was once that enigmatic, fascinating and immensely complicated space called Yugoslavia.